Helen F. Rappaport (née Ware; born 1947), is a British author and former actress. She specialises in the Victorian era and revolutionary Russia. Rappaport was born Helen Ware in Bromley, grew up near the River Medway in North Kent and attended Chatham Grammar School for Girls. Her older brother Mike Ware, born 1939, is a photographer, chemist, and writer. She has twin younger brothers, Peter (also a photographer) and Christopher, born in 1953. She studied Russian at Leeds University where she was involved in the university Theatre Group and launched her acting career. In the early nineties she became a copy editor for academic publishers Blackwell and OUP. and also contributed to historical and biographical reference works published by for example Cassell and Readers Digest. She became a full-time writer in 1998, writing three books for US publisher ABC-CLIO including An Encyclopaedia of Women Social Reformers in 2001, with a foreword by Marian Wright Edelman. It won an award in 2002 from the American Library Association as an Outstanding Reference Source and according to the Times Higher Education Supplement, 'A splendid book, informative and wide-ranging'. In 2003 Rappaport discovered and purchased an 1869 portrait of Jamaican nurse Mary Seacole by Albert Charles Challen. The picture now hangs in the National Portrait Gallery. 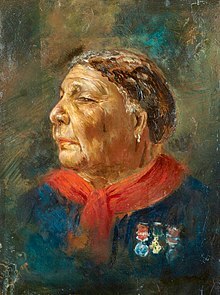 Mary Seacole features in Rappaport's 2007 book No Place for Ladies: The Untold Story of Women in the Crimean War which was praised by Simon Sebag Montefiore as being 'Poignant and inspirational, well researched yet thoroughly readable' and also received positive reviews in The Times and The Guardian. Her 2008 book Ekaterinburg: The Last Days of the Romanovs received many positive reviews in both the UK and US where it became a bestseller. Conspirator: Lenin in Exile published in 2009 gained considerable publicity due to Rappaport's claim that Lenin died from syphilis and not a stroke. Her 2010 book, Beautiful For Ever describes the growth of the Victorian cosmetics industry and tells the story of Madame Rachel who found both fame and infamy peddling products which claimed almost magical powers of "restoration and preservation". According to the Daily Mail, 'Rappaport handles her scandalous Victorian melodrama with energy and aplomb, and produces a richly entertaining portrait of the seamy side of 19th century society'. Magnificent Obsession was published on 3 November 2011, the 150th anniversary of its subject; the death of Prince Albert. Capturing the Light: The Birth of Photography, co-written with Roger Watson, tells the story of Henry Fox Talbot and Louis Daguerre. Both authors took part in an event during the Edinburgh Book Festival on 14 August 2013. Caught in the Revolution: Petrograd, Russia, 1917 – A World on the Edge was published in 2016 in the UK, where it received many positive reviews. Rappaport is a fluent Russian speaker and is a translator of Russian plays, notably those of Anton Chekhov, working with Tom Stoppard, David Hare, David Lan and Nicholas Wright. —Rappaport, explaining her feelings towards the persons she wrote about. ^ "Helen Rappaport's top 10 books on Lenin". The Guardian. London. 2 September 2009. ^ Helen mentioned her relationship in a session during the Edinburgh Book Festival on 14 Aug 2013. Mike Ware has investigated early photographic processes in great depth. ^ "Writer Helen Rappaport reveals her love of Russia, all things Victorian and the landscape of the Medway marshes in conversation with Sylvia Vetta" (PDF). Sylviavetta.co.uk. Retrieved 6 January 2018. ^ a b c d "The Viney Agency". The Viney Agency. Archived from the original on 30 August 2011. Retrieved 7 October 2011. ^ "Helen Rappaport". IMDb. Retrieved 6 January 2018. ^ Melanie Gow. "Helen Rappaport – The Interview — Beat". Beatmagazine.co.uk. Archived from the original on 5 April 2012. Retrieved 7 October 2011. ^ a b c Rappaport, Helen. "Helen Rappaport Biography". Helenrappaport.com. Retrieved 6 January 2018. ^ Rappaport, Helen. "Encyclopedia of Women Social Reformers". Helenrappaport.com. Retrieved 6 January 2018. ^ Rappaport, Helen. "Helen Rappaport & Mary Seacole". Helenrappaport.com. Retrieved 6 January 2018. ^ "Long-lost Seacole portrait found". BBC News. 11 January 2005. ^ "Mary Seacole - National Portrait Gallery". Npg.org.uk. Retrieved 6 January 2018. ^ Rappaport, Helen. "No Place for Ladies". Helenrappaport.com. Retrieved 6 January 2018. ^ Rappaport, Helen. "Ekaterinburg - UK Reviews". Helenrappaport.com. Retrieved 6 January 2018. ^ Rappaport, Helen. "The Last Days of the Rromanovs -US reviews". Helenrappaport.com. Retrieved 6 January 2018. ^ Britten, Nick (22 October 2009). "Vladimir Lenin died from syphilis, new research claims". Telegraph.co.uk. Retrieved 6 January 2018. ^ Rappaport, Helen. "Beautiful For Ever". Helenrappaport.com. Retrieved 6 January 2018. ^ Rappaport, Helen. "Helen Rappaport Four Sisters: The lost Lives of the Romanov Grand Duchesses". Helenrappaport.com. Retrieved 6 January 2018. ^ Rappaport, Helen. "Helen Rappaport Caught in the Revolution Petrograd 1917". Helenrappaport.com. Retrieved 6 January 2018. Alican Çakmak Kozoğlu (2012). "Royal Monomania: Helen Rappaport by Alican Çakmak Kozoğlu". Literal Affairs (Interview). Literal Affairs. This page was last edited on 27 March 2019, at 21:00 (UTC).